Strengths: Morozov has always had a great offensive upside, but only reached his full potential as a dynamic scorer and playmaker once he returned from the NHL to Russia. He is a natural leader on the ice, calm in any situation, and a role model for future generations. Weaknesses: Morozov is not a physical or tough player, making his style of play less suitable for the NHL than Russia. In recent seasons, he is no longer as offensively dominant in the KHL. 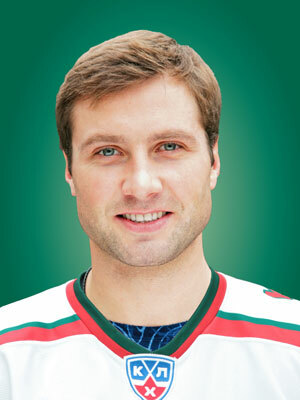 Biography: Born and raised in Moscow, Alexei grew as a hockey player in the Krylja Sovetov (Soviet Wings) hockey school. At the age of seventeen, he made an instant impact on the organization’s senior team and earned himself two trips to represent Russia at the World Junior Championships, where he collected two bronze medals. At age twenty, Morozov made a smooth jump to the NHL, playing for the star-studded Pittsburgh Penguins and scoring in his very first NHL shift. That season, Morozov won a silver medal with Russia at the Nagano Olympics and was named to the NHL’s All-Rookie Team. It would take a couple of seasons for Morozov to earn top-line playing time on the Penguins. Morozov began the 2002-03 season at a point-per-game pace playing on a line with Mario Lemieux and Alexei Kovalev, but had to miss most of the season due to a fractured wrist. The NHL lockout of 2004-05 put Morozov’s NHL future permanently on hold. Instead, he began an illustrious career with Ak Bars Kazan of the Russian Superleague. In his first season, Morozov out-performed all of his teammates, including stars like Ilya Kovalchuk, Alexei Kovalev, Vincent Lecavalier, Brad Richards, and Dany Heatley. Despite most stars returning to the NHL once it resumed, Alexei decided to stay with his team and helped lead Ak Bars to the Russian championship in 2006. Morozov was named the playoff MVP. Along with Danis Zaripov and Sergei Zinoviev, Morozov became part of one of the most dangerous hockey lines in the world. Ak Bars repeated its championship win in 2007 and Morozov recorded a Superleague record of 83 points in the regular season, earning him the league’s MVP title. His other accomplishments with Ak Bars include being the MVP of the 2007 European Champion’s Cup (which his team won), leading the league in scoring again in 2007-08, and being the playoff MVP of the Kontinental Hockey League’s first championship, the Gagarin Cup, which Ak Bars won in 2009 and again in 2010. In international competition, Morozov has become Russia’s go-to leader since 2007. 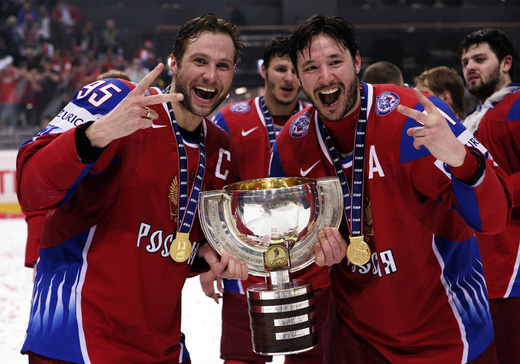 He led Russia in scoring at the World Championship in Moscow, where Russia won the bronze medal. Then, he captained Russia to back-to-back gold medals at the 2008 and 2009 World Championships, in Quebec, Canada and Bern, Switzerland. It is telling that since 2007, Russia lost only one World Championship match – a game that Morozov had to sit out due to an injury. Unsurprisingly, he was the captain of Russia’s 2010 Olympic hockey team and Russia’s flag-carrier at the opening ceremony in Vancouver.